Hello old time Factorio players and steam newcomers as well! The steam release went pretty smooth, we received new batch of bug reports, but they were manageable and the 0.12.25 update covered most of it. The tech tree visualisation is getting closer to completion, the examples shown here are showcases of the icon organisation logic. The graphical representation (lines) and some details will be updated with the help of our graphics department, but the result will probably look close to this. The logistics 2 technology icon is big as it is the selected one. We might add an additional way to indicate that it is the currently selected research. Requirements and continuations of the technology are both shown here. Here you can see all the requirements of the personal roboport research. 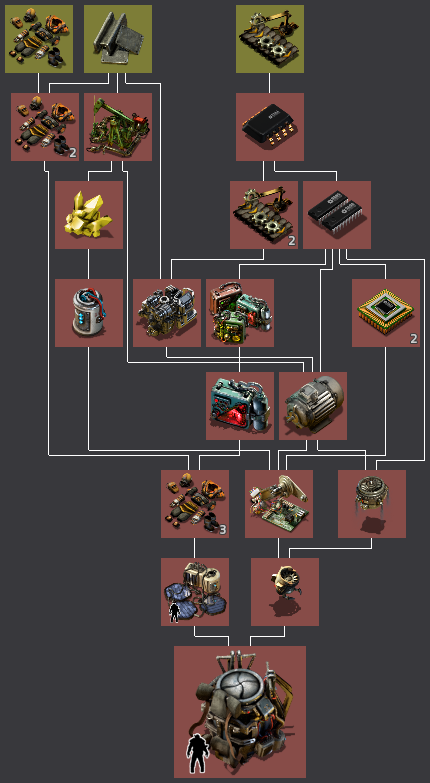 I believe it will help players to understand the tech tree a lot, and improve readability. As the algorithm is general, it can especially help to clarify complex mod research dependencies. Loader - yes or no? I have this idea of the missing transport belt related piece for some time, so I made a prototype to see how useful is it. It is an entity that can load or unload the contents of a container as fast as the transport belt can handle. It is 2X1, and it's much more expensive than inserters so they are still viable in many places. As it affects the core mechanics of Factorio I want to be really careful with it. High throughout support for belt loading/unloading. Makes belts (and trains) more relevant in comparison to robots in the late game. Train stations could be more compact and faster to build. High capacity storage based on belts would be easier to build and more useful. Another entity that has to be produced. Lot of the belt balancing setups will become obsolete, as the solution with loader is quite trivial. I would like you, the Factorio players, to give us your opinions on this topic in the forum thread as usual.